I'm not exactly sure why this idea works, but it does. 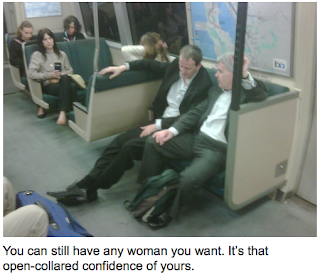 ... Well, I do know: six thankfully anonymous people writing terse captions about radically normal scenes. An existentially Greek chorus commenting about things you see every day in YOUR life. It grows on you. Sexpigeon. 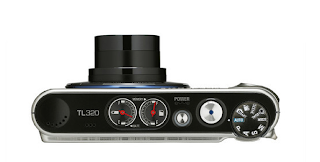 One of the most interesting point and shoot cameras may soon be getting an update. Sigma has let some writers get a look at a pre-production DP2, the successor to its much-admired DP1. The highlights would seem to be an extended focal range, plus a higher ISO (from 800 to 3200) and menus that make more sense. The DP1's forte is no doubt the image quality at low sensitivities. The camera offers a resolution and an amount of detail that is unheard of in the compact camera sector and can keep up with quite a few DSLRs. To make the most of it you have to shoot in RAW though. The DP1's JPEG output is very desaturated and flat and needs a 'boost' in post processing. 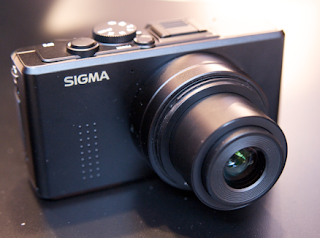 For more about the DP2, here's RichardK reporting for SigmaUser.eu from Focus on Imaging. The beach plays a big part in the minds of the people in Rio de Janeiro. It's not merely a place to absorb the sun's ray. It's a social circus, an important venue for sports and even business dealings. It's a people-watcher's paradise. t's not easy for a casual visitor to understand the complex beach culture in Rio, but with a keen eye it is possible to pick out the different cliques and crowds that inhabit the acres of sand, that change according to the time of day or the day of the week. 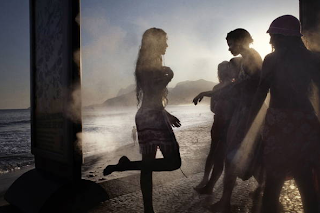 Every beach in Rio is a scene for fashion and trends. Also people from the "favelas" reach the beach with their surfboard. Surfing is a very popular sport for "cariocas", although they don't have the best waves for it. The whole concept of catching waves and hanging out on the beach is a perfect fit with their mentality, based on the art of flirting and the joy of living. 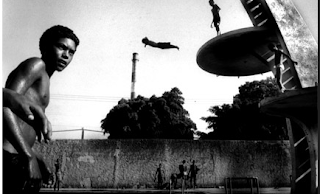 More images from Zizola's Rio project are here. His website is here. Samsung has announced its new TL 320, and it has gauges on the top that show how much memory and battery power you have left. Cool. It also has a 5x optical zoom range that starts at a nice-and-wide 24mm. The wider, the better. Some other stats: 12 megapixels, 3-inch screen, 720p HD video. More official details here. It's listed at $379 at Amazon, but isn't available yet. "We believe that photojournalism is a powerful tool for telling compelling social, political and cultural stories. We also understand that creating and managing world-class photography assignments requires time, freedom, support and considerable resources. Since 2005, we have awarded five Grants for Editorial Photography annually to professional photojournalists. Each grant provides $20,000, plus editorial, logistical and promotional support. We also award four student grants of $5,000 per year to photojournalism students at accredited schools." The deadline to apply is May 15. More info here. My friend Cory Mervis called the photography of London-based Nils Jorgensen some of the best street photography she had ever seen. "Great eye, great catch, complicated patterns, and so funny!" 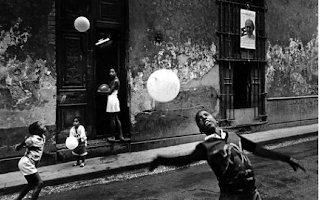 We went to see and hear the amazing Ernesto Bazan talk the other night at UC Berkeley's J-School, where a wonderful collection of photographs from his recently released book, "Cuba" is on display. It's not hard to figure out why Bazan has been such a successful workshop leader. He is gracious and encouraging, and he just seems to speak from the heart. He stopped and talked with us in the hallway as we looked at the photos on display, and he was very funny about modern cameras, and how much he still likes film. A student had showed up at one of his workshops with a Nikon D-700, and he marvelled at its low-light capabilities. But he hasn't gone digital yet. For one thing, he can get his Canon film cameras and lenses more cheaply than ever before. "No one wants them!" 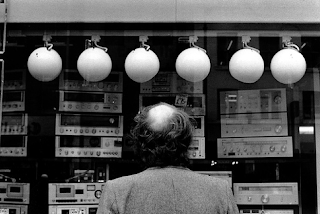 He's also been experiementing with an Xpan of late, and he loves it. If you are in the Bay Area, go see the prints. They're just wonderful. Beautiful. They have all the grainy, gritty realism that Tri-X can offer. And if you are not in the area, buy the book. It's pricey at $85, but one of the reasons it costs so much is that they used the most sophisticated printing and papers available to get the deepest and richest blacks on the pages. Bazan said later that he was amazed at how far the publishing world has come in being able to reproduce the deep rich blacks of a halide print, and the book is good evidence of that. Also, the book is a way of allowing a true documentary photographer like Bazan to keep working. He spent 14 years in Cuba, during the "Special Time" after the collapse of the Soviet Union. It was a time of great hardship for the people of the island, and Bazan gives an unbelievably intimate look at of the people. We were all amazed at how so many of his subjects seemed so completely unaware of his presence. It was like a camera had dropped into the middle of their lives . But there is no secret, really, Bazan said, to how he got so close to his subjects. "You just have to spend time with them." He did, and it shows. The photos are a far cry from the photojournalism produced when photographers parachute into a area hit by calamity -- wars, famine, hurricanes. 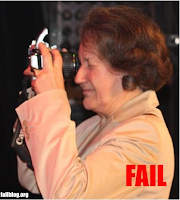 That's not to diminish the importance of photojournalism. But Bazan gives you a look at life as it is lived. There is so much to see in his photos; there are layers and layers of content. Your eye might be caught by a grimacing face in the foreground, then a set of eyes a little further into the photo, then a marvelous texture behind them both, then perhaps a smokestack in the distance. It's like you are falling into the scene. Incredible, really. The book is actually a collaboration; all the photos are Bazan's, but the selection and editing and layout took two years to complete. At the end of his workshops, after he had been "severe and harsh" with his students, Bazan let the tables turn and asked his students to look at his layouts and prints and offer opinions. There was no lack of them. He credits 50 people with helping produce the book. "I have no idea what the book might have been without them," he said. You can see the prints at UC Berkeley's graduate school of journalism, at the corner of Hearst and Euclid. You can buy the book on Bazon's website. The program was presented in collaboration with Fotovision. The folks at PhotoShelter asked image buyers what they wanted in a website, and the results are surprising. Keep it simple: people hate sites with graphics in the background. Make it easy for people to know how much things cost. If your site takes more than 10 seconds to load, half your visitors will give up on you. Don't play hide-and-seek with your navigation arrows. Function is valued much more than form. If you site looks cool but has quirks in the works, you're in trouble.